This tutorial is designed to teach the “home brewer” how to make high quality liposomal essential oil formulations. It does not cover how to use them. This tutorial utilizes the ultrasonic encapsulation method, as apposed to using the blending method. The essential oil used is peppermint. Liposomal peppermint oil is one of the easiest formulations to make. It is very stable, and has a greater shelf life than many other liposomal essential oils (EOs). Furthermore, it is currently being studied for its strong antimicrobial properties. The same general procedure can be used to create other liposomal essential oils, or even essential oil blends. PLEASE NOTE: That there is a new tutorial on making an antifungal spray using LEOs at EarthCures.org, that demonstrates how LEOs can be used externally. What is a Liposome? …and Why Encapsulate Essential Oils? What is a liposomal formulation? In our case, it is a colloid made up of spherical phosphatidylcholine particles that exist in a water medium. Inside the lipid (fat) particles, the “substance of choice” is encapsulated — surrounded– by the spherical particles. In essence, the encapsulated substance (in this case, peppermint EO) exists inside of the lecithin, which is suspended in colloidal form within the water. Liposomes are nature’s perfect bio-delivery system. What is the best natural liposomal formulation? Easy: Breast milk! Essential oils are not water soluble, and they are not very bio-available. Furthermore, they cannot be diluted down for easy and safe in water. However, once in liposomal form, they become completely bio-available. Furthermore, you can dilute one drop of liposomal essential oil (LEO) in as much water as needed. The LEO will completely disperse in the water. You can even add one drop of LEO to a gallon of water, and it will disperse evenly throughout the whole gallon. Links to products are provided (Amazon) as necessary. If no link is provided, then simply choose your own personal preference. Making liposomal essential oils is actually very easy. EOs lend themselves to encapsulation very well. In fact, it only takes about 1% phospho-lipids to get the job done. Furthermore, the process is very forgiving. In the event of error, one simply needs to add a bit more lecithin or essential oil. 1. Use 1-10% grain alcohol (40 or 50 proof) by weight. The grain alcohol immediately separates the lecithin particles, and helps to prevent clumping. 2. Heat the formulation while encapsulating. Heating the lecithin changes the permeability of the lecithin, allowing easier penetration of the essential oils. Lecithin is actually very heat resistant at the temperatures we will be using. While, as stated above, it only takes about 1% lecithin to essential oils used, different essential oils may require slightly different amounts of lecithin. Sometimes, one may need to add just a bit more lecithin in order to encapsulate all of the essential oil. It’s easy to tell when more lecithin needs to be added. After processing the brew in the ultrasonic cleaner, a “puddle” of essential oil will pool on top of the water. If this happens, simply add a bit more lecithin and reprocess. If you don’t have access to a good scale, you can always “eyeball” the amount of lecithin to use. The images in this tutorial will give you an idea of how much is needed: Not very much! Measure out the essential oil. For a four ounce bottle, 1/4 ounce of peppermint oil will be needed. Weigh the essential oil in a small measuring cup. Use grams if possible. Make a note of the weight. The weight will be used to calculate the amount of lecithin required. Pour the essential oil into the 4 ounce glass container. This container will be used to process the liposomal peppermint oil in the ultrasonic bath unit. Calculate the amount of lecithin to use by multiplying the weight of the essential oil by .01 (one percent). 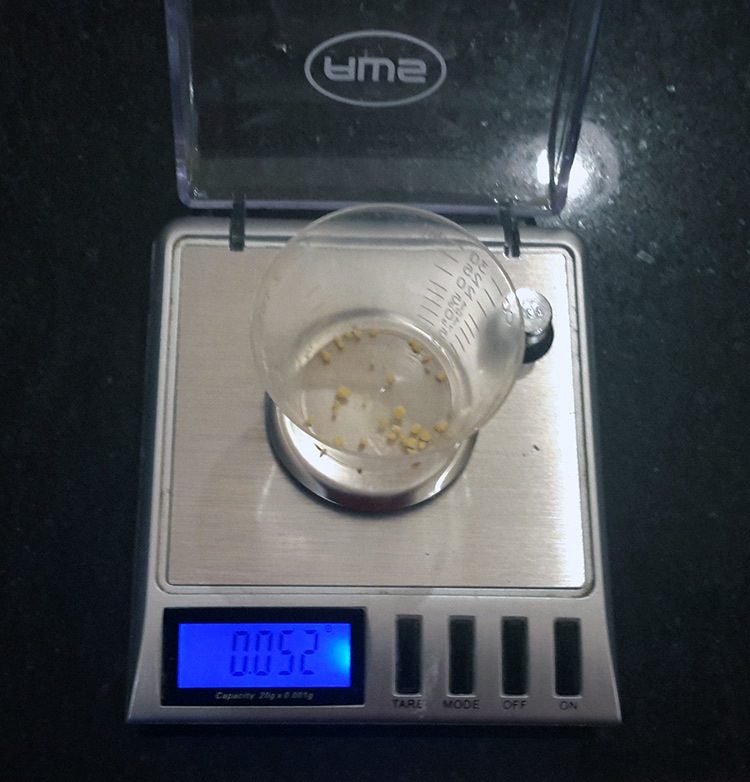 Using a second measuring cup placed on the scale, measure out the required amount of lecithin. Then, pour the lecithin into the 4 ounce glass container that currently contains the peppermint oil. Add between 1 and 12 ml of the grain alcohol into the 4 ounce glass container. Watch how the lecithin immediately begins to separate the lecithin particles (a small amount of the lecithin will have already dispersed in the water). Add about one ounce of colloidal silver (or distilled water). Now, prepare the ultrasonic bath for operation exactly as described in the device’s manual. 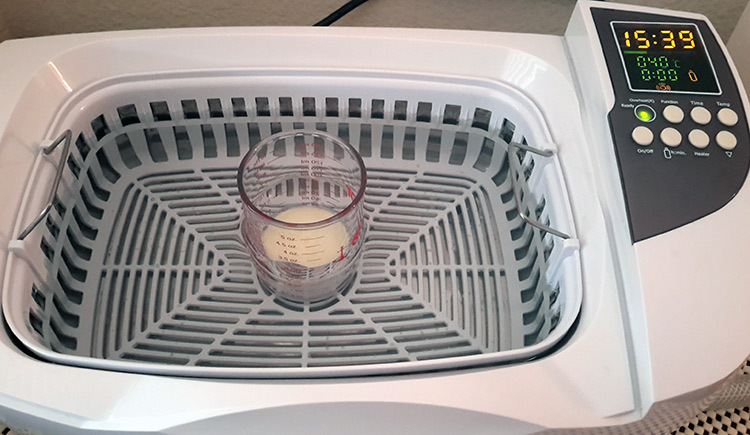 Place the 4 ounce glass container on the rack in the center of the ultrasonic bath. The bath that we recommend purchasing can be run for 30 minutes at a time. It also has a heater, which is important. Turn the heater on, set the ultrasonic timer for 30 minutes and press start. During this process, stir the LEO every so often. It is also wise to check the temperature after 15 minutes, although the target temperature usually will not be reached until the second run of the ultrasonic bath. Once the timer runs out, repeat the above process. Set the timer for 30 minutes, and be certain that the heater is on. Keep in mind that the heater is on a auto shut off timer. If you are uncertain how long the heater has been running, simply turn it off and on. This time, check the temperature of the formulation at the ten minute mark, and every five minutes afterward. Once the temperature reaches between 105 degrees F and 115 degrees F, turn the heater off. Allow the ultrasonic bath to finish its cycle. Observe the surface of the “water” very carefully. You should see a layer of melted lecithin on top. This surface layer of lecithin will be rich with essential oils, and it is completely normal. However, if there is a layer of pure essential oil separated from the lecithin, more lecithin is needed. Simply add a bit more lecithin, and process the batch again for 30 minutes. Once again you can heat the formulation up to between 105-115 degrees F if necessary. Note that all of the liposomal peppermint oil beneath the top lecithin layer is completely white! When liposomes are fully dispersed in water, they are always white. When there is lecithin that doesn’t disperse in water due to concentration levels, the color is yellowish-orange. 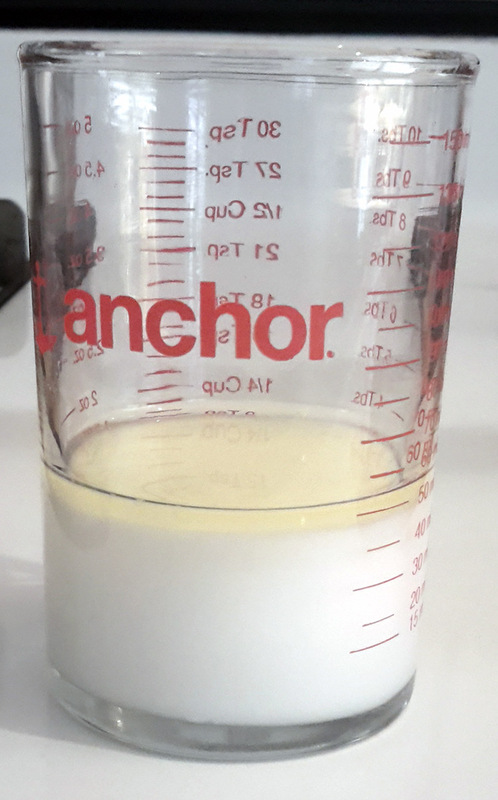 When this lecithin is diluted in more water, then the color should change to white, indicating a proper formulation. If no separated essential oil is floating on the surface, the ultrasonic bath is no longer needed. You are done processing. Fill the glass container up to the 4 ounce mark with colloidal silver (or distilled water), and mix well. Transfer the completed LEPO into the 4 ounce glass dropper bottle. Only make what you plan on using, and always refrigerate LEOs when not in use. Different liposomal essential oils will have different shelf lives. That said, liposomal peppermint oil and liposomal Ceylon cinnamon oil are both very stable and resist degradation more so than many other types of LEO. More information, including a commentary and more FAQs, will be added in the future! Isn’t there a way to make the formulation so that there is no top layer of lecithin once complete? Yes, absolutely. However, doing so will result in dosing difficulties. With this method, 16 drops of the essential oil is the equivalent of one drop of pure essential oil. Making a more concentrated formulation works perfectly, and is much more convenient to store and use. Furthermore, if you don’t need precise dosing information, you can take that top layer of lecithin, and add it to coconut oil to make a fantastic lipid-rich essential oil cream for topical use. Can the blender method be used in place of the ultrasonic method? Yes. However, keep in mind that any time you use a blender, you are greatly increasing oxidation, and you do not have any control over the heating. Furthermore, you would most likely have to use a dedicated blender for this process. It is difficult to get the smell of essential oils out of plastic. The ultrasonic method creates a superior product to blending, despite rather loud voices claiming otherwise. I see quite a few very affordable ultrasonic cleaners available for purchase online. Why can’t I purchase one of the cheap ones? If you can find an affordable ultrasonic cleaner with the right specifications, feel free to get one! Please keep in mind that most of the “cheap” models have a maximum run time of about five minutes. Furthermore, many of the affordable models do not have heating elements. If you plan on actually making liposomal formulations, you really need a machine that can run uninterrupted for 30 minutes. A unit that has a heating element is also important. Can I use a different type of cinnamon? I have access to very affordable oils. Please ONLY use Ceylon cinnamon bark oil. By using other types of cinnamon oil, you risk causing serious liver damage. Can I use Ceylon cinnamon leaf oil? For this tutorial, please use Ceylon cinnamon bark oil. Once you are familiar with the process, you can diplicate it using any essential oil that you’d like, at your own discretion. Why does this process only take an hour of ultrasonic processing? When making liposomal vitamin C, the recommendation is to process for much longer, refrigerating the formulation between ultrasonic sessions. Essential oils, when combined with lecithin, almost encapsulate themselves without effort. Essential oils lend themselves to encapsulation very easily, since they are non-water soluble solvents. There is no need to over-process them, although it will not hurt if they spend more time in the ultrasonic bath. Some companies make a gel, not a liquid. Should I be making a gel instead? NO. Studies published are conflicted about the true efficacy of liposomal formulations. The main reason: In order for a formulation to be highly effective, the lipids MUST separate into their “spherical” liposomes. Furthermore, when used internally, liposomal formulations should be taken with a lot of water. At least eight ounces. This will dilute stomach acid and allow the liposomes to be absorbed into the body intact. In the tutorial, you use lecithin derived from soy. Can another form be used? How about lecithin derived from organic sunflower seeds? Please keep in mind that lecithin derived from soy is completely devoid of the protein that causes issues in the human body. That said, it is difficult to find organic soy lecithin compared to organic sunflower lecithin. However, it may be surprising to realize that tolerance to the soy lecithin is better. If you use sunflower lecithin, and have tolerance issues, it’s probably due to the lecithin. Will this process make nano liposomes? Should I add another emulsifying agent? YES. This process will make liposomes on the small end of the nano liposome spectrum. However, it is not a guarantee that all of the liposomes will be uniformly sized, as there is no process in place to ensure that only nano lipids are formed. That said, this method, especially with the “gentle heat” and use of grain alcohol, is the superior process to use outside of a very expensive lab setting. What is the shelf life of liposomal essential oils? If the oils that I use are antimicrobial, shouldn’t they preserve the formulation? Assume that the refrigerated shelf life is 60 days. The actual shelf life will depend on many factors, including how much lecithin is used, and the exact properties of the essential oil(s) used. The issue with liposomes: Most of the EO will be encapsulated. It is impossible for the EO to be in contact with all of the lipids all of the time. Lipids are great food for both humans and microbes. There is plenty of open surface area where essential oils and colloidal silver cannot act as preservatives. This is why liposomal formulations must be refrigerated and “made to use” only. There are exceptions to the rule. Liposomal peppermint oil and liposomal ceylon cinammon bark oil both resist bacterial and fungal growth very well. Is it really worth the equipment investment? Are liposomal formulations that good? If you love essential oils, or if you want to be on the cutting edge of alternative medicine, then: Yes. You are not limited to making essential oil liposomal formulations. My favorite liposomal formulation for detox (advanced): Alpha lipoic acid, NAC, glutathione, and vitamin c.
1. Using lipids to encapsulate essential oil makes the essential oils water soluble. This makes managing concentrations MUCH easier. 2. Recent studies done with Bergamot demonstrate that essential oils used internally “as they are” are not bio-available enough to be truly effective (in this case, targeting cancer cells). Liposomes are nature’s finest bio-delivery system (breast milk is liposomal). 3. The lipids help protect the encapsulated EOs from the external environment. 4. The body recognizes phosphotydalcholine (and other lipids) as actual food. All human cells require it. 5. Liposomal formulations mix very well with other substances for topical use. This tutorial doesn’t delve into the use of liposomal essential oil formulations. If you are interested in more specific liposomal formulations, please let me know by commenting below. I have quite a few amazing advanced liposomal formulations from Eytons’ Earth – Private Stock! Abstract: In-vitro study of the effectiveness of liposomal bergamot essential oil on cancer. Inhibiting and degrading biofilm using the most effective essential oils. Liposomal tea tree oil and silver ions yield improved antimicrobial activity without the possibilty of the microbes developing a resistance. …an example of a complex liposomal essential oil formulation: Antimicrobial blend. Please note that this formulation is no longer commercially available. This is a fantastic journal article written for “Evidence-Based Complementary and Alternative Medicine”, Volume 2014 (2014), Article ID 651593. The article is entitled “Essential Oils Loaded in Nanosystems: A Developing Strategy for a Successful Therapeutic Approach”. This article gives a great overview of essential oils in general, and specifically… section 4… deals with nano encapsulation. Note that the article states that LEOs are not only more bio-available, but also likely more bio-effective. The methods and materials we use produce a wide range of extremely small particles, which are ROUND IN SHAPE. The round particles prevent cytotoxicity otherwise commonly associated with nanoparticles below the 40 NM range. The PC used to create the liposomes (from the lecithin) are the absolute ideal delivery system. Be sure to check this article out! Learn how to make LEOS: Liposomal essential oils. This tutorial explains how to make liposomal peppermint essential oil using the ultrasonic method. Awesome! Thanks so much Jason for all that you share with us! Jason is there a less expensive ultrasonic cleaner that ca be used instead of the iSonic? …you can try to find one! 2. Most will only run for 5 minutes or so at a time. This means that you’d have to keep resetting the unit over and over again. If you find a good one cheaper, please let me know! Is there an alternative/ substitute I can use for the grain alcohol? I think my digestive track has trouble tolerating tinctures. I do not think I can take meds with alcohol in them anymore. I had been making tinctures with grain alcohol, but lately that has not been working so well for me. You can simply omit the grain alcohol if necessary. It is certainly possible to become sensitive to grain alcohol. Some people cannot tolerate it at all. You will still get liposomal essential oils, but the liposome particle sizing won’t likely be as minute. This not a real issue, considering that many people make liposomal products simply by blending things with phospho-lipids. The refined process simply allows one to make a higher quality end product. If you want to try to stabilize the nano lipisomes created with ultrasound… without the use of grain alcohol… you can experiment with adding glycerin and synthetic vitamin e (Tocopherol). However, I have not yet calculated the amounts to use, so you’d have to experiment! I most likely will be incorporating glycerin and Tocepherol in my own personal formulations to help stabilize the nano sized liposomes. Some people cannot tolerate it at all. BTW: There is a method to remove alcohol from tinctures using gentle heat and a a grain alcohol alcohol hydrometer. Depending upon the herbs and the amount, it can take 4 to 12 hours to rid tinctures of the alcohol. Simply pour your tincture into a wide-mouth glass jar or measuring glass. Use very low heat as to not destroy the properties of the herbs. I use a little fan blowing on the surface to speed the process up. If your tincture is 50/50 (100 proof), then simply evaporate the tincture down by about half. 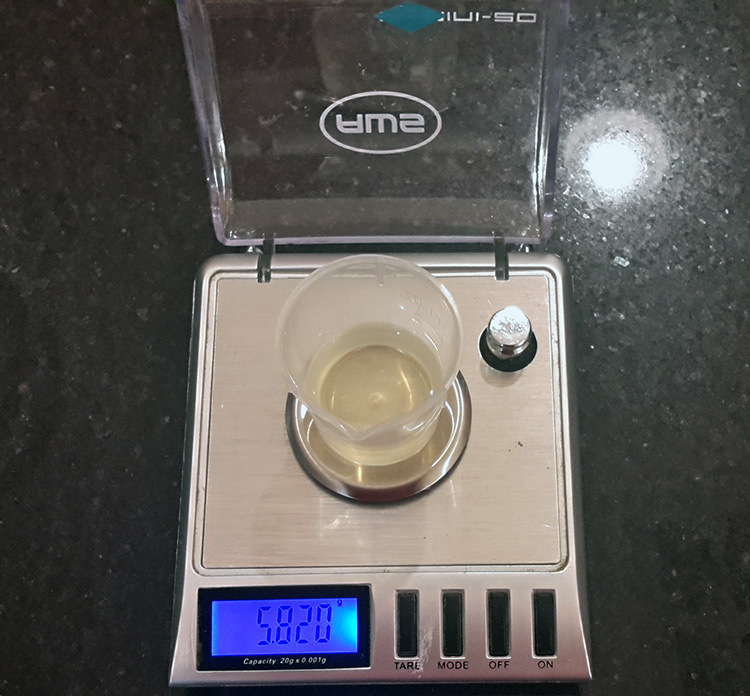 When you think you are done, use a tall and THIN graduated glass cylincer (100 ML is usually ok)… pour the tincture into the cylinder a little over half way. Then, insert the glass hydrometer. If all of the alcohol is gone, it will read “0”. If it rises “above the line” you still have some alcohol to evaporate off. When are done, add some purified water back in to return the tincture to its original strength. Remember, that with the alcohol now gone, refrigerate your tincture and keep in mind that it will have a short shelf life! Thanks for the follow up directions. I was worried about destroying the medicinal properties of the tincture. Hello Jason. Thank you for your research and generosity. I had a thought. Those not accustomed to weighing out ingredients on a scale, may not know about “tare”. To “tare” is to place your container on the scale and subtract its weight by pressing the “tare” button on the scale. A simple thing, but very necessary in order to get correct weights. I do not know if there are self tareing scales? I have become lazy about making my liposomals. This has re-inspired me! Good point! When I update the article, I’ll add this info. Until then, hopefully people either read the comments, or their instruction manuals! …You are welcome. I have noticed that I research in spirals. I’ll finish a project and start work on another research project. Then, finally, I come full circle, and get inspired to return to a given project. Usually, the “inspiration” is “coincidental”, but it always seems to result in a major personal breakthrough. With each “return”, I gain so much more depth perception into the subject matter… deeper and deeper. The new understanding from project “A” usually “magically” lends itself nicely to the next project, the next inspiration. I tried your recommendation of using Glycerine and Vitamin E to replace the alcohol to stabilize the nano liposomes. You were right about the particle size. … but it worked. I was wondering what you thought about using Sodium Alginate and chitosan. Before I found your post, I found numerous experiments on essential oils in which those two ingredients were used with sonication. I read that Sodium Alginate is a natural polysaccharide product extracted from brown seaweed that grows in cold water regions. It is soluble in cold and hot water with strong agitation and can thicken and bind. In presence of calcium, sodium alginate forms a gel without the need of heat. I read that Chitosan is a sugar that is obtained from the hard outer skeleton of shellfish. I cannot figure out why they used that. I found this combination in numerous studies. I haven’t yet worked with either substance, but certainly the Sodium Alginate should work. When you add other sugars and “fats” to the mix, you’re reducing the number of PC liposomes, and this will likely change how the body utilizes them. That said, who knows if it would be a reduced, improved, or the same end effect. I personally like the type of formulation as this tutorial presents, because it is then very, very easy to get the liposomes separated “in solution”. If a gel is too thick, it can reduce absorption, which is why some studies on liposomal formulation do not show an improved biological effect like one would expect. Nano encapsulation is only relevant if at some point the liposomes separate independent of biochemical reactions. However, conversely there may be a benefit to using a more gel-like formulation. This might reduce the amount absorbed, but the gel would coat the digestive tract as it is digested. You could further DECREASE the systemic effect and increase the effect in the digest tract by incorporating something like castor oil. …lots of creativity left to be explored. As far as chitosan, I know that NANO chitosan is being studied for its anti-pathogenic effects. PS. I am looking at alternate formulas because I would like to do this with herb extracts and I am having trouble finding Vitamin E that is considered safe for consumption. Hi Jason. I appreciate you insights and responding so quickly. Really Interesting information about Nano chitosan. Thanks. this i just in case I can’t find more Vitamin E that does not say do not consume on the bottle. Wish I could just do the grain alcohol formula. Another question. I wanted to do the same with herbs. do you think glycerin could be an acceptable substitute for the alcohol? I am leery because when I tried to switch from making tinctures with alcohol to glycerites, many were not that strong. I was tincturing a lot of Chinese medicine herbs which uses a large number of roots. So now the plan is to tincture with alcohol, boil of the alcohol, and now I am considering adding glycerine and and a preservative like potassium sulfate (vitriolated tartar) or some other preservative. I guess I have to determine that they are safe and will not effect the liposomes. bearing in mind what you wrote about adding other sugars and “fats” to the mix, I guess that would eliminate potassium sorbate since it is a fatty acid. I think that you are on the right track. You are absolutely correct about alcohol tinctures being far stronger than anything else. I would go ahead and make the alcohol tincture, then evaporate the alcohol off, and then combine it with glycerin…and alpha-tocopherol if possible/desired. This is a synthetic vitamin e, but it appears to be safe to use, especially since you’d only be using it to take advantage of its unique property as a water and fat soluble medium. Dr. Christsopher Shade uses it, and his knowledge of biochemistry is extensive. His formulations are pain staking as far as attention to detail and efficacy goes. As far as preservatives go, I don’t use them. I refrigerate my brews after removing the alcohol. That said, things like potassium sorbate/sulfate can be used, if absolutely necessary. Gosh you are fast. This is great news! Trader Joes has a Vitamin E I can use. That was my block. Understand your sentiment about preservatives. Because so many people in my family are ill, we have very little food in the house with preservatives. Maybe cheese……I basically feel the same, but got nervous because some of my first batches of glycercites– celery seed, turmeric/ pepperine, and maca molding in less than a month. I realize it was likely that I did not stick to the rule about making sure that your ratio of glycerine to water is more than 50% glycerine. All my other batches have been fine. 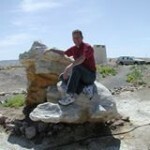 I was looking for another solution because I have been tincturing, juicing and fermenting like crazy. Now I am adding liposomoals and I may have to start making raw dog food for my dog. (He is sick too. We are running out of room in the frig. We have been talking about getting a frig to put in the garage. I guess I may have too. PPS. two a second look after MSM after reading your article. Found that it was could not only for collagen but nerve damage as well. Just keep in mind that the synthetic vitamin e has different properties then natural vitamin e, as far as vitamin e’s ability as an emulsifier. I’m not sure how great the difference would be. MSM can be really amazing even though high dose MSM therapy is a bit controversial. Sometimes you have to use a lot to get the job done. I also recommend that you take a look at my most recent blog post, not just for hydrating therapeutic clay, but for making very high quality salt soles. I think that almost everyone should be taking at least 1 tsp daily of the highest possible quality salt sole. I haven’t found anything to replace it… which is probably why Raymond Dextreit lists sea salt as one of the seven irreplaceable healing substances on the planet. For those in digestive system failure where nothing else has seemed to get the job done, a person might try taking 1-3 tsp. of nine times roasted bamboo salt daily, while also drinking plenty of water throughout the day. …I also have written tutorials on how to make ozonated olive oil and ozonated castor oil specifically to make rizol with… BUT, it is time consuming and requires specialized equipment. You can always buy the ozonated olive oil and the ozonated castor oil, and then make the rest yourself. This stuff stays bio-active where ever it is used for at LEAST 12 hours. Super sick animals or people might consider using it as a suppository, building up to a standard does of one whole ounce. So I rambled on so much, you missed my main question. If I want to use the liposomal process with herbs and cannot not use the alcohol, what should I do? Do I use the Glycerine and Vitamin E? Yes. The purpose of the alcohol is only to get the smallest sized nano liposomes possible. That is the single function that it serves. Hi Jason: i promised myself I was going to stop bugging you today, but then you posted all this great information. So more questions. if you do not feel like answering, I won’t be offended. We’ll see about the cabbage becoming palatable. :-). I hope so. I think I remember doing high does of MSm in the past. I was also pulsing really high doses of vitamin D with good results. I why is it controversial? The on>ly reason why I stopped is I read that it could make migraines worse and after my alcohol problem, I was worried about my digestive track. What are the contraindications, or is it like with Vitamin D,.. just a misinformed medical community. I’ve been meaning to check out your clay. I used it twice with great success to repair my digestive track. Since the grain alcohol fiasco, I started taking it again. Funny you mention ozone, I was just in my garage cleaning it out partially tofind my ozone machine. No luck. 200 rounds of chemo left me unmotivated for a long time and now it is a big closet, but I will persevere. my memory of Ozonated olive oil making was that it is very complicated process, so I used to buy it. In fact, I still have some ozonated olive oil and cococut oil in the frig, but it is very old, so i do not know whether it still has its potency. I was very ill with severe cognitive issues when I tried to make it before. my brain is mostly recovered so when I find the ozone machine, I will give the Para Rizol Zeta a try. I had a lot of success with ozone theraphy. It is funny that you mentioned Castor oil, I will just research how to ferment Wheat Germ and Castor oil. I am hesitate, because I am a whim and I am scared to ingest. However, I will likely peruse it after I learn how to use the tincture percolator I just make. My brain it about to burst trying to learn how to do all this stuff. My husband now calls our house the apothecary. Regarding the essential oil formukla, I did not see the how to take essential oils post, until after I made mine. I really like it. Most of them are listed as being effective as liposomals in treating lyme, so as soon as I finished this batch, I was going to try your formula and add one more … yarrow into it. Regarding suppositories, I had been trying to convince my teen daughter to use this approach, but I did not consider using it on my dog. I thing he has something called Pemphigus Foliaceus cause by a vaccine he received when he was a puppy. He mostly takes the capsules I give him and he loves turmeric, ghee and yogurt, but the Ayurveda formula I was using stopped working, so I am looking at chinese medicine and I am afraid that it would require too many capsules. Making an extract and putting it in a suppository might work. it is a great idea. I will definitely try roasted bamboo salt. I’ve been having suggest with dragon’s blood, D- Limonene, papain, mastic gum, noni, slippery elm, marshmallow root, and Golden Thread. It is working, but the faster me and my daughter can recover from this digestive crisis the better. Do you sell it on your clay site or do I buy it elsewhere? The thinking is that taking huge amounts of sulfur (or any substance) can throw off the biochemical balance in the body. In some cases, this is likely true. With MSM, some people may have issues. Did not see any of the bamboo salt in your store, but I read your article on making Himalayan and Bamboo Sole and saw the specific brand you recommended there and purchased some on Amazon as you referenced in the post. read that you will be offering in the future. I will check back the next time I need some to see if you have begun selling it. Thank you, that is appreciated! Yes, I’m still in the process of finishing testing the Bamboo salt. We will most likely be selling it in 1 kg. containers (bulk). In the preparation section, Step 6, you mention to “Add between 1 and 12 ml of the grain alcohol into the 4 ounce glass container”. between 1 and 12ml is quite a large discrepancy. Can you explain what decides the exact amount of grain alcohol you use? That’s a great observation and a great question. Since essential oils lend themselves to encapsulation very well, you can use the least amount of alcohol and still achieve a good end product. However, for individuals who want to absolutely positively make sure that they have the smallest nano-sized liposomes, and who are not bothered by the alcohol content, the maximum suggested amount should be used. The maximum amount is calculated based on how much grain alcohol is needed with other substances (like vitamin c). Furthermore, there are some essential oils that “encapsulate themselves”, like peppermint oil. Then, there are other essential oils like Ceylon Cinnamon, that may benefit from using a bit more grain alcohol. Haha, awesome. Thanks for your detailed answer. I assume you’re using US Fluid Oz? It worked out great, thanks again for running through the process. One problem though, I doubled the volume of my next batch and have ended up with yellow oily pools on the BOTTOM of the measuring glass. Tried adding more Lecithin thinking it was oil, to no avail. Should time be increased with Volume of the batch? If you modify the formulation/recipe, you’ll have to “trial and error it” like I did when in research and development mode! What I do when making greater quantities: I use multiple brewing vessels. I can easily fit six units in an ultrasonic bath at one time. More volume means that more energy is required for processing. I made this formulation to be certain that you are getting the absolute most out of the ultrasonic unit, as far as volume and surface area goes. Also, a single container for a single processed batch also makes quality control easier. You are ABSOLUTELY guaranteed to be able to know precisely how much essential oil is in each end container. This, in my opinion, is important for titration issues. Lastly, watch out for LECO: Liposomal Cinnamon Bark Essential Oil. This stuff is so powerful that you need to have a lot of self-knowledge to use safely. There is no warning when you hit a ceiling dose. It will just hit you like a hammer. Be gentle with that stuff! Thanks Jason, much appreciated, I will test it out and see what happens. 10:4 on the Cinnamon, i’m using it topically and not ingesting so besides a slight bit of skin tingling it’s been great so far. An added bonus is that I smell like Christmas pudding! Going to try out LipoC as well. Thanks again for all of your guidance and patience! If you ever decide that you want to improve the external formulations even more, you can make what I now call Lipozonoil… A version of Para Rizol Zeta, but using liposomal essential oils rather than just “plain” EOs. What lipozonoil does is extends the bio-active time of the EOs, and the formulation acts very much like a time release system. The lipozonoil also acts more like a salve, which means that it can insulate the skin, which I believe results in more LEOs penetrating the skin. Excellent Jason, I’ll definitely give that a shot and really appreciate the suggestion. I found that the skin over time seems to be becoming sensitive to Cinnamon and on further research found that it’s fairly common as Cinnameldehyde can be aggravating topically (Got the book Essential Oil Safety as a guideline). Single or low volume applications seems fine but if it’s 2x daily for 1 month it can gradually induce mild sensitivity. Nothing major though. One more question, what is the purpose of the Colloidol Silver in your LEO process? And how come there’s an option for distilled water instead. Would you prefer one over the other? Silver is great for the tissue healing process (it speeds healing, sometimes significantly), and of course possesses antimicrobial properties. I wouldn’t buy CS to use in the formulation (expensive), but if you make your own, it’s a good addition. You are welcome, thanks for stopping by! Great thanks, I’ll have to try and make some as was buying online for large amounts. Is heating oils at 105-115 degrees F does not damage the compounds in them. Most of the oils are not heated up to temperatures above 78 degrees F.
Some compounds has a boiling point 86 F.
I researched the heat sensitivity of phosphatidylcholine before writing the article. Short term heating of PC as recommended in this article does not significantly degrade the PC. I also field tested the difference between using “room temperature” processing. If you are worried about the temperature, use the “low end” of the recommended temperature. 105 degrees is just hot enough to change the permeability of PC, allowing for easier encapsulation. 1. I have an ultrasonic without a heater – how is the heater part necessary in the process? 2. I read elsewhere to only use Ceylon Cinnamon Bark EO. Are there other restrictions pertaining to Bergamont, Tee tree oil, eucalyptus, lemon grass or peppermint? The heat just changes the permeability of the liposomes, making encapsulation easier. It is not absolutely necessary. I’m not aware of any issues with the other essential oils, only cinnamon. “Can the blender method be used in place of the ultrasonic method? First thanks for the article, the procedure you outline is very similar, as in ethanol usage to other guides on liposomal preparation such as Liposomal C.
I have to disagree with the quoted statement. Blending is far less likely to produce oxidation than ultrasonic cavitation IMO where extremely high temperatures cira 5000C are produced. You have probably noted that when using ultrasonic energy, the water temperature rises quite a bit even without heating. Not really sufficient if using cold water to reach the desired temperature but it does rise by around 8C in my experience so far. This is a reason why I have big doubts about using ultrasonic energy to create liposomes. Oils and fats are very susceptible to oxidation which can change the properties of oils and fats. With essential oils the essential oils properties and effects could dramatically change, rendering them ineffective. I wanted to produce liposomal essential oils for antimicrobial usage but the idea that ultrasonic energy could render the antimicrobial properties ineffective is not something that I want. Beating the infection is difficult enough without the essential oil becoming ineffective. I have been trying to find a method to reduce the oxidization of the essential oils by using a suitable antioxidant. So far I have not come up with anything that could be used. Plenty of food for thought, thank you. I still believe that the ultrasonic method described is superior, I’ve seen SEM images of liposomes made with this method (Lip Vit C), which is why I adopted it for liposomal production. I also personally tested using neat oils vs. liposomal essential oils, using the same equivalent dosing. The effect of the liposomal essential oils was much more pronounced then the oils used neat. I agree that the method is not perfect. Perhaps consider using a full spectrum alcohol extract of turmeric as a suitable antioxidant? I have a very talented chemistry associate who uses it in formulations for just this reason. I did find research that supported the idea of employing heat, and found supporting data that indicated that the lipids are temperature safe at 115 degrees F… I wish I had bookmarked it, but I didn’t. Therefore, I don’t know the exact consequence of oxidation in the ultrasonic method. I do know the consequence of using a blender, as I did comparative analysis, and studied how blending increases oxidation by studying the effect it had on aerobic bacteria. I hadn’t considered that ultrasound might some how increase oxygen exposure. I suppose the way around this would be to use a sealed container with very little… or no… air exposure. I do have another chemistry associate that pumps argon gas into a sealed chamber in order to eliminate oxidation (in an unrelated process than LEOs). So in summary, this is, in my opinion, still the best process that a home brewer can use to create nano liposomes… The only improvement I can currently see is adding synthetic vitamin E to help stabilize the emulsion and ensure the smallest possible liposomes. I am, however, always open to new ideas! Thanks for your detailed article. 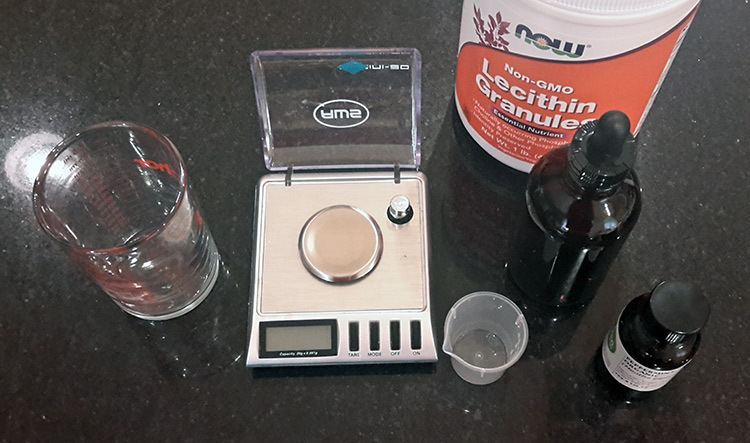 I bought some sunflower lecithin, non-GMO off Amazon and have used it for my first glutathione liposomal preparation. I have an ultrasonic bath and did the blending Etc but the liposomal were at the bottom of the jar the next day. I was hearing stuff about the quality of the PCS in sunflower versus soy. Can you advise? I don’t know if I should trash the expensive sunflower lecithin and start all over with non-GMO soy lecithin. That is my most important question. I also read while making liposomal not to use the liquid one. And I see that you use the liquid one. Can you explain how that is better? …it’s a bit more difficult to make liposomal glutathione then to make LEOs (liposomal essential oils). The amount of lecithin to use will likely vary between soy and sunflower lecithin… so I can’t tell you exactly how much to use. However, the amount of lecithin to glutathione will likely be about two parts to one… which is a lot more lecithin than is required to make LEOs. What you want when you are finished is a stable, thicker gel so that settling cannot occur. What happens is that only a little bit of the glutathione is water soluble, so the rest falls out of suspension and settles at the bottom of the container. When you get a thick enough gel, it prevents the settling. 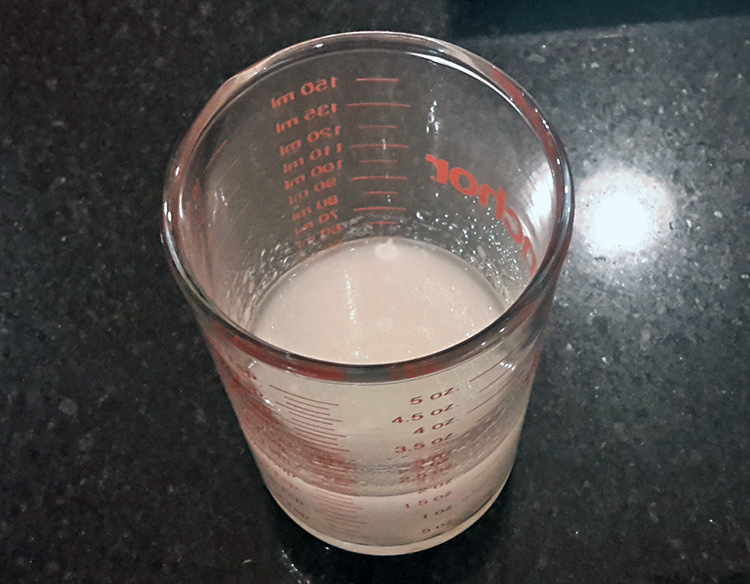 When you add, say 5 ml to 4 ounces of water and mix it well, it should become almost white. The “white” doesn’t occur with all substances (due to variations in light refraction), but with most liposomal formulations, the white color indicates properly sized… and properly separated… liposomes. I don’t actually use a liquid lecithin, I use a very expensive and specially formulated gel that has the consistency of a thick syrup. I would not use the cheap liquids either. Also, I only use the gel formulation with essential oils. When I make other liposomal formulations, I use non-GMO soy lecithin. Strangely, I prefer it over the sunflower lecithin (my body responds better to the soy lecithin). thanks for this very informative article, i have been thinking about different methods of bio-delivery for EO’s, particularly the “hot” oils as these seem to be the strongest antimicrobials often working synergisticly with antibiotics. i have explored oral, transdermal and sublingual. sublingual seems the most promising when diluted sufficiently with a carrier oil. The active ingredients in the oils i am using are quite small and could theoretically pass the bbb readily. In your view what is the major advantage of liposomal EO’s over the much simpler sublingual method. can liposomes be used sublingualy and finally are liposomes expected to cross the bbb intact or is the agent released from encapsulation before. The major considerations are titration and concentration. Research has shown that EOs are nuetralized very quickly in-body. They are very volatile. Do carrier oils protect EOs and deliver them? To a certain extent, yes indeed. However, phospholipids are a much better idea since they are used as “food” by cells themselves in native form; no need to process hence “digest” them. Using sub-lingual to deliver small concentrations of EO into the blood for brain purposes is probably a great idea, as long as you are looking for smaller concentrations. That said, with liposomals and the “hot” oils (especially ceylon cinammon), you can deliver therapeutic concentrations into places like soft tissues and the lymphatic system. I believe a lot of chronic conditions are the result of pathogens “hiding out” from the immune system, where they propagate and then spread “into” the body’s active metabolism. Killing them in the blood stream is not enough. When the body is healthy and the immune system is functional, they simply wait with opportunistic patience. When a person gets ill, and the conditions of the body change, they advance. When they can advance more effectively than the immune system can respond, then a person gets really ill with “mystery illnesses”. So I’m sure that there is a place for both methods of delivery. As far as I know, the science hasn’t been done to be able to say what methods are best for what effect. The only way to gauge is field testing: By experience. im going to try this with hot oils for internal use. i may try mixing oils as well. …that looks just fine. I like the beaker holder, that would help make things easier. im going to try this with hot oils for internal use. possibly mixing a few different ones. going very slowly at first, i have a big respect for the potency of EO’s and combining them with lipo multiplies them. from my reading it seems possible to use lipo’s sublingualy and i may try that. from what i read this lippo /EO combination has enormous potential. could i ask you to review this sonic cleaner? is it adequate in your opinion? or should i buy the one you recomend? Do you know why liposomal formulations do not work on me? I have treatment resistant mental health problems and was thinking of making some liposomal lavender. I thought it was my blood brain barrier. But then I thought after writing to a liposomal company that my liposomal glutathione doesn’t work and that should be absorbed by ever cell in the body. If liposomal pass through the stomach and brain better does this mean my liver is the culprit since my stomach is not the problem? One thing to consider… Taking liposomal glutathione cannot compensate completely if your own oxidation/anti-oxidation processes are not working in the body. In essence, taking a glutathione supplement cannot “fix” Phase 2 detoxification if your body is not producing adequate amounts of glutathione itself. So I’m not sure what exactly you are trying to accomplish with glutathione…. if your body is under a great deal of oxidation stress, consider making and drinking an abundance of molecular hydrogen water, and learn how to use things like purple nine times roasted bamboo salt. The primary goal is to make sure that your diet is ideal to support glutathione production. If you don’t get your eating habits right, then chances are other therapies may fail when they otherwise might succeed. Thank you for sharing this and For your clay! I noticed you use the bio body Phosphatidylcholine and this is what I want to use also. Would I use the same amount as I would lecithin and does this change the process? Also if I’m using alcohol tincture herbs is it the same process as essential oils? You should be able to use the same amount of the Body Bio PC as you would lecithin. However, essential oils are very different to encapsulate than herbs. Usually, you would use the herb itself (usually dried/powdered) rather than using a tincture. With herbs and other substances (which are not solvents), you need to use a lot more PC… so I don’t use the Body Bio PC, as it would be too expensive. Now, I suppose you COULD encapsulate an herbal tincture, and since it is an alcohol extract, you might be able to use as little PC as with the essential oils. I’ve never tried it, so you’d have to experiment and see. You wouldn’t need to add any grain alcohol to the process, as the grain alcohol is present in the tincture. Thank you ! The Phosphatidylcholine is expensive but compared to the Biopure Liposomal cocktail at $80 for 2 ounces it seems extremely cheap. I will be making it from the tinctures and will report back the results. Good point! Non-GMO lecithin, is of course, even more affordable as well. But the balanced PC from Body Bio is pretty amazing stuff. Yes, please let me know how things go. Have you researched how the khz level impacts liposome formation? According to their website the isonic unit with the beaker attachment runs at 35khz. However I’ve seen other cleaners spec’d at 40khz and others as low as 28khz (semiwave). Also wondering about the “degas” feature and what potential impact it could have. Thanks for your help. I wanted to do more research on this before responding, but I have not had time! I would say that yes, frequency would certainly have an impact. I’m not sure exactly, but I can say with confidence that one frequency over another is not going to make a LEO “not work”. By using an ideal frequency, you might be able to get a superior end product, but I’m not sure what that ideal frequency might be. I think it would be hard to determine scientifically. Thank you for this post! It’s the first of its kind that I’ve found on the Internet. I’m working on a product that will attempt to do a lot of the antibacterial lifting through EOs, so this was a cool find. I actually approached the formula from a kitchen standpoint, so the sun-flower lecithin was a natural idea for emulsion. My concern is how the oils half-life hold up over time in water even as lecithin is the main emulsifier? I’m also using Citric Acid to help buffer with a lower pH. Granted I’m not looking for a year’s preservation, but about six months worth at best. That’s the biggest concern, you bet! If it is not a perfect emulsion, it’s a concern. When the “fat” breaks down/separates from the EO it becomes perfect microbe food. Check out Dr. Christopher Shade’s liposomal formulations. By using both grain alcohol and synthetic vitamin E, he gets a perfectly dispersed solution. If you use enough citric acid and grain alcohol, you won’t need anything else, BUT, finding that “sweet spot” might not be easy. Mine do pretty good, but I use mostly highly antimicrobial oils. But I am careful to sterilize EVERYTHING, and handle them with care. I wouldn’t sell them without instructions to refrigerate or treat as perishable… not without a lot more work field testing shelf life! The refrigeration portion is a good idea for sure. It’s hair care that I’m after. Trying to manipulate the circumstances with the hurdle approach by the bottle being a pump delivery for one. I don’t have the alcohol portion but I do have glycerin (though it was gifted to me by a chemist, doesn’t do much for me to not know if it’s from a plant source or animal source). I’ve also been trying to see if there’s any synergy between clove, cinnamon and thyme. I’ll have to focus on highly antibacterial EOs as well. How do you do your sterilization process? I’ve been rubbing everything down with alcohol pads. Sometimes I boil bottles, otherwise I use H2O2 (spray). Using a spray bottle, I have found, means that you can get full coverage and don’t accidentally miss a spot, but rubbing alcohol certainly works fine! I didn’t think f this earlier, but it appears that you’re creating a separate solution that can be added to something else for later? For example, I end up adding the lecithin, EOs, etc. to my product at the same time shortly after it’s boil, then blend it all together. But what I’m understanding here, is that the LEO could be added as its own component and be dispersed in that same boiled liquid, thus making the EOs do more work with less volume? You can use LEOs by themselves or as part of a formula. I use them to make a “hacked” version of Para Rizol Zeta, and also along with other ingredients for things like a topical anti-fungal formula. Encapsulation keeps the EOs bio-active for much longer, when used both internally and externally. Thanks for the info. I’ll definitely give it a shot when ready. Currently I’ve been adding and mixing with the only thing I have, which is a good processor on pulse mode. I also do have another question: is there a functional difference between animal and plant glycerol? Hi Marcus, I’m sure that will work fine. I’m not well educated on processing/using glycerol, so I don’t know if there would be any difference. Thank you for the conversation on this; hope I’m not pestering. I’m going to wrap back around on my formula and see how far I can get with EOs, especially LEOs. How do you feel about making LEOs with a blend from a provider like doTerra or Plant Guru? Do you prefer to start with your own and then blend together when you do or not? Especially with most EOs, a blender will work. They lend themselves to encapsulation very easily. We’re only talking about making a more refined product with the ultrasonic processing and heat. When you achieve a white end product, you know that you have nano sized lipids. You can really only achieve this color with essential oils, because with other substances (like vitamin C), you really do need to use much more lecithin. So the orangish color, in that case, doesn’t necessarily mean larger particles, as the color you are seeing is not due to light refraction, but the color of the lecithin itself. I’ve done it both ways. If I’m trying to find the exact right amount lecithin for a single oil, I’ll do it alone. But I’ve made blends using twelve or so oils before (studying the “Tick Slayer’s” EO treatment system but with LEOs).